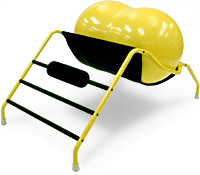 The VersaBack combines a specially shaped Swiss ball with a supportive frame to form an exercise station for low back strengthening and rehabilitation. The VersaBack's unique configuration also make it a versatile support for many other core strengthening exercises. Regular use of the VersaBack will strengthen muscles that stabilize your spine, which can help significantly reduce low back pain. The primary cause of low back pain is instability of the lumbar spine, which is often the result of low back muscles that have been weakened by extended periods of sitting. One of the most effective ways to strengthen these muscles is to perform the reverse hyperextension exercise (which is illustrated in the following section). The VersaBack does a better job of supporting your body for this exercise than any other fitness product. The VersaBack's elevated height also makes it very easy to get on or off of this device, even when you're compromised by low back pain. To perform the reverse hyperextension exercise, lay face-down across the center of the VersaBack, with your stomach over the center of the ball. Grasp one of the rungs of the VersaBack frame, and allow your feet to rest against the ground. While you're in this position, you should be able to relax your back and torso and feel a comfortable stretch. Then slowly contract the muscles of your back, to raise your legs to a horizontal position. Repeat for several slow, controlled repetitions. You can change the difficulty of this exercise, simply by changing where you position your body across the ball. Move your hips further away from the rungs to increase the difficulty; closer to the rungs to decrease the difficulty. During this exercise, the contoured and compliant surface of the VersaBack's peanut-shaped ball stays in contact with your pelvis and torso, which supports and stabilizes your spine, and allows you to fully contract your lower back muscles. EMG testing has confirmed that the VersaBack is several times more effective than other exercises for recruiting the use of these muscles. Swiss balls (sometimes called physioballs) have become very popular for balance training, and are a challenging addition to many training programs. They decrease the stability of an exercise, which forces your body to rapidly contract more muscles to maintain balance and proper form. Unfortunately, Swiss balls add too much instability to some exercises, and can put some individuals at risk for further injury. The VersaBack uses the Swiss ball's best feature - the flexible top surface - and adds to it a stable, elevated base. This makes the VersaBack easier to get on and off of, keeps the ball from rolling out from under you, and makes it possible to perform a wider range of exercises. Note that the VersaBack's ball can also be removed from the frame, which allows you to perform most standard Swiss ball exercises, if so desired. And it's unique peanut shape provides a wider, more comfortable support surface than other balls. Includes frame, ball, and instruction guide.